Sports Camps Canada is excited to announce the return of Ivy Hockey Academy’s prestigious hockey camp established by the Moore family, now at 7 locations across the GTA and North Kawartha. Designed by former NHL player, Mark Moore, and guided by the Ivy L.E.A.F schema (Learn. Enjoy. Aspire. Fulfill. ), this team of elite hockey players is committed to helping kids of all ages and skill levels achieve their goals on and off the ice. Mark is one of three brothers to play in the NHL, including his youngest brother Dominic Moore who is currently playing for the Toronto Maple Leafs. Summer hockey camp at Ivy Hockey Academy is the perfect environment for player’s ages 6-16 to develop and refine their skills while learning important life values and enjoying fun activities with friends and coaches. With our proven track record of on-ice results, happy children and satisfied parents, we guarantee you'll get better and have fun. Whether hockey is just a stepping-stone or you dream of playing in the NHL, there’s a program for you. 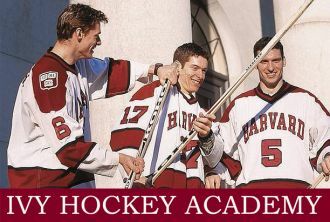 The Ivy Hockey Academy will show you the training methods and secrets that help you get to where you want to be and beyond.